The villa is centrally located, with good restaurants and a lively nightlife close by. (+/- 5 minutes drive with a scooter) Its equipped with all of the luxuries you have at home. Tasteful decorated, large living room, open kitchen and 3 bedrooms: Master bedroom with a king-size bed and bathroom, 2 bedrooms with king-size beds and a bathroom. The kitchen has cooking facilities, a large refrigerator, coffee machine and microwave. The villa is centrally located, with good restaurants and a lively nightlife close by. (+/- 5 minutes drive with a scooter) Its equipped with all of the luxuries you have at home. Be amazed by the beautiful location of the bungalow, while experiencing the feeling of home. Walking street is only 5 minutes drive from the villa. On arrival we welcome you at the home, the beds are made for you, Linen and towels are provided. We can also pick you up at the airport and bring you back after your holiday; our driver will be waiting at the airport and bring you to the holiday home. Ask for the conditions. For renting a bike, scooter or car just let us know, we can arrange it for you. 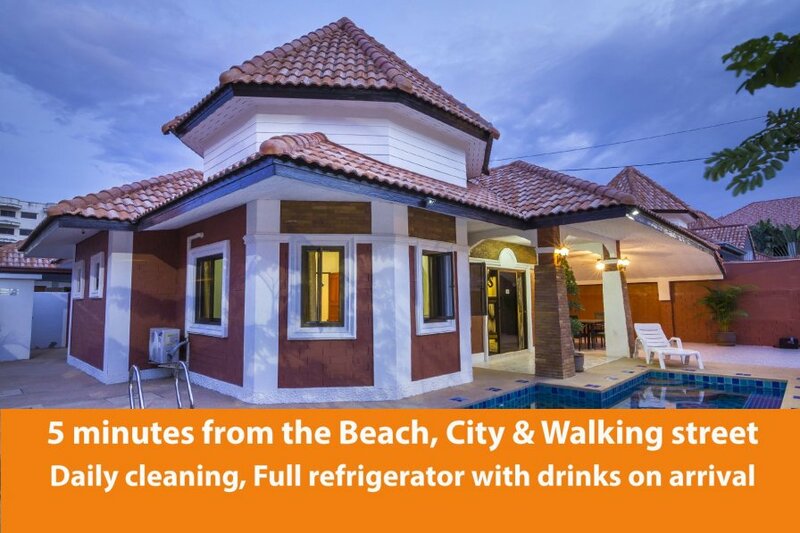 The Villa is located near the beach from pattaya and Jomtien, so enjoy Jomtien with his quiet beaches, beautiful boulevards with restaurants and night markets and get a cold drink at the bars with terraces on the Rompho Market. Around Pattaya and Jomtien you will find blue buses, they drive 24 hours from Pattaya to Jomtien and back, just for a few baht (depending on the distance between 10 and 20 baht) But you can also ask them to bring you directly to the villa for a few baht more, 24 hours. From the villa to the center of Pattaya or to the beach the cost with a open taxi are 200-300 baht, max. 8 people. Or take a moterbike taxi, just 100 baht to bring you to the city of Pattaya. Because the Villa is located on a compound we ask you to be quiet when you come back in the evening or at night. Your neigbors like to have their sleep also with their families. On arrival we ask you a security deposit for 200 euro, you will receive that back when we check you out the day that you leave the villa. Electric and water are excluded, on arrival we will read the meters with you. VIP Taxi, on arrival at the airport we can pick you up, our private driver will be their with your name on a plate and brings you comfortable to the Villa. Scooters, during your stay you can rent scooters with us; on arrival they will be ready at the villa. VIP tour Bus, we provide tours around Pattaya with a VIP bus, you will have a private chauffeur during your stay. Information map, on arrival you will receive a map with information about restaurant, bars, tours, golf, and more that can be visit in Pattaya. Taxi service comes to the compound for your daily shopping or to go to a nice restaurant, but on walking distance there are bars, restaurants and supermarkets also. The Villa has a washing machines but when you don’t want you can bring it to the laudry service just outside the compound. Restaurants, bars and daily grocery you will find within a few minutes walk from the Villa, also 24 hours supermarkets, like the 7-Eleven and family markets.